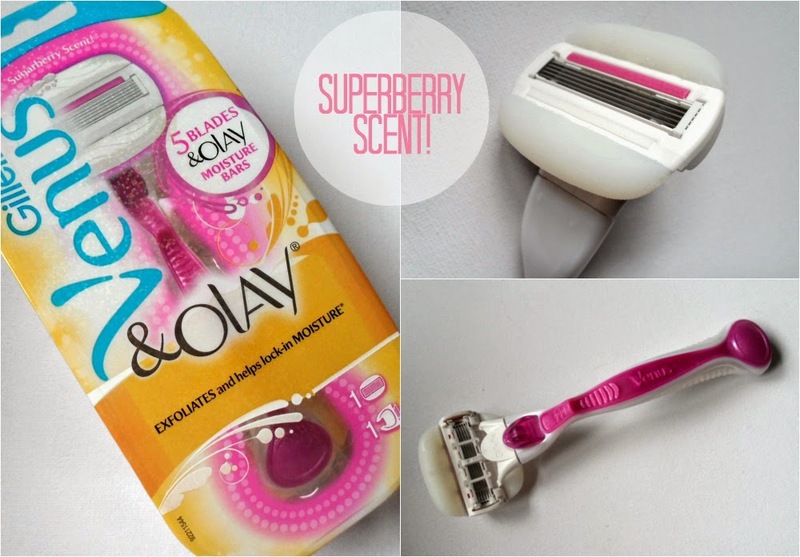 Sophsterlicious • UK Blog: Gilette Venus & Olay Superberry Razor. Y'all love silky smooth pins, right? I know that I do. But as the winter months come in, we can get a little bit lazy and let some of the fuzz make a reappearance. Ugh! I am typically an epilator kind of girl, especially for summer, but that can take more time than I like, so I like to have a razor at hand for when I want the job done. This razor from Gilette Venus is so nice! I had the old, plain style Venus razor before this, and I was more than happy with it but this just takes it up a level. This razor contains the great five blade razor head for a great, close exfoliating shave... Then it has the superberry moisture bar with Olay, that feature is so cool! First off, it smells incredible, it makes your legs feel extra silky and it takes out the need for any shaving cream because it creates a light lather on your damp as you shave. It also comes with a cool little in shower holder that you can stick it to the tiles so you can reach for it when you need it! This razor has totally made me want to bother with shaving my legs more! (Yep, even in the winter!) because it's fun to use and makes my legs feel so lovely. The moisture bar keeps them feeling so soft for ages after too. Gilette Venus & Olay Superberry Razor* £10.99.